The food photography you usually see in high-street food outlets wouldn't win many awards; it generally consists of yellowing images of burgers or takeaway chow mein encased in a greasy laminate. But I'm in the unusual position of gazing at a gorgeous image of a Thai beef salad that's being projected onto my plate from a gizmo mounted above my table at Inamo, a restaurant on London's Wardour Street. It closes the sale to this particular diner, so I order it direct from the kitchen using an iPhone-like touch panel which is also projected down onto the table. While I wait, I can enhance my mood of calm control by choosing a projected tablecloth of an idyllic rural scene; Inamo's waiters remain a discreet, uninterrupting presence, while passers-by press their noses to the window, intrigued by the activity inside. I click for a beer; it's brought to my table in less than 30 seconds. And for a magical moment, it feels like a futuristic dining utopia. Inamo opened in the summer of 2008 in a difficult economic climate which would eventually drive many restaurants out of business. But by contrast, Inamo has performed surprisingly well: it now serves more than 200 customers per day; another restaurant opening is due later this year, and 900 reviewers on the restaurant website toptable.com give it a healthy average mark of 7.6 out of 10. A restaurant is nothing without good food, of course – and Inamo doesn't fail on that score thanks to signature dishes like yuzu mussels and cinnamon chicken – but it's the patented technology that's making gadget fans' mouths water. And the unlikely brainchild of two rookie restaurateurs is starting to hit paydirt, with other restaurants now set to license the technology that's kept Inamo buzzing throughout the recession. Noel Hunwick, Inamo's managing director, recalls the moment where he and business partner Danny Potter, a fellow Oxford graduate (one classicist, one physicist) came up with the concept. "Five years ago we were at a venue for a friend's birthday party, and the service was pretty poor. And we thought how great it would be to get what we wanted by tapping the tabletop. We spent a year working on the idea with an industrial designer, and eventually had a software architect build a test unit in his bedroom for us to play with." Aside from Potter having spent three months chopping vegetables in the kitchen of the Ritz in Paris, the pair had no previous restaurant experience, but they nevertheless chose a high-profile – some might say high-risk – location for their launch after buying up an old trattoria, Luigi's, in the heart of London's West End. Fortunately their gamble paid off; an idea that could have been seen as a gimmick ended up being a hit with London's diners. "I think it's only a gimmick if it distracts from the food," says Hunwick, "or if it doesn't work." The technology has certainly proved reliable; complaints from diners that "my table has crashed" are non-existent, and the paper menus kept in reserve for emergencies have never been needed. But why have the British dining public – who you might imagine as being resistant to change – embraced it? "Obviously the rise of computers and smartphones mean that we're much more used to the idea of pointing and clicking," says Hunwick. "But it was still a challenge to make the system completely intuitive. If people needed a manual to help them use it, we knew we'd failed." It's certainly proved a hit with children – and not just because of the games built into the system; a YouTube video entitled Max Explains Inamo, in which the five-year-old son of an Inamo customer whizzes through the ordering process, has proved to be a priceless piece of accidental PR for the restaurant. Tongue-tied couples on first dates also love it, notes Hunwick. "There's always something to talk about," he grins. But there are simple, functional reasons why it works, according to Marina O'Loughlin, the notoriously incognito restaurant critic for the London newspaper Metro. "Direct electronic communication between the diner and the kitchen means less human error," she says. "There's nothing that fills me with more anxiety than someone taking my order without even writing it down." Speed of service is also enhanced: a restaurant around the corner from Inamo, Bob Bob Ricard, has incorporated a "champagne buzzer" to alert waiters that you need your glass of fizz refilled, but Inamo's touch-table system means there's never a reason to wave wildly in the hope of attracting attention. It's a godsend for restaurants when fast turnarounds are a priority, while the diners appreciate not having to endure the often tortuous process of actually leaving a restaurant; at Inamo, your bill and a chip-and-pin machine are a click away. However, not everyone is enamoured by this potential point-and-click revolution. Wide adoption would undoubtedly mean job losses within the industry, although Hunwick counters that the removal of many of the mundane aspects of the dining experience means that existing staff are more available and attentive. But Amber Dalton, restaurant editor at Waitrose Kitchen magazine, sees Inamo's technology as only suitable for keenly-priced restaurants with swift turnaround, and can't see it being deployed in the high-end sector. "I like the idea of a system that allows you to attract the attention of waiters easily," she says, "but once you start paying more money you expect more human interaction, waiters and sommeliers with expertise. And speed isn't really an issue, because you don't want to rush the experience, so in those contexts techie does seem a bit tacky." O'Loughlin has observed that awkward collision at first hand: "There's an upscale restaurant called Switch in Las Vegas where the technology lets the decor change every hour – and even in novelty-obsessed Vegas, it does seem people would rather eat surrounded by Picassos than machinery." But many restaurants do feel compelled to incorporate technological innovation. These days you'll find chef-cams in a number of restaurants, displaying action from the kitchen to diners who may have exacting food preparation standards – although, again, Dalton isn't a fan: "Personally, I find it quite unpleasant seeing my food prepared; rather than watching chefs sweating into my soup, I prefer to imagine it arriving on the plate by magic, or at least by a team of squeaky-clean individuals who don't have dandruff or dirty fingernails." On a more functional level, the last month has seen both toptable.com and restaurant chain Wagamama proudly launching iPhone apps, and while these are for booking and takeaway respectively, the smartphone may have a role to play within the restaurant itself. An American-made app, DineBlast Mobile, is being touted as the future of self-service for those restaurants that adopt the system; aside from the service benefits, they claim a boost to sales through impulse buying. Hunwick has seen this at Inamo: "There's definitely evidence that diners spend more using these kind of facilities – firstly because it's fun to order, and secondly because there's no barrier to getting what you want, when you want it." 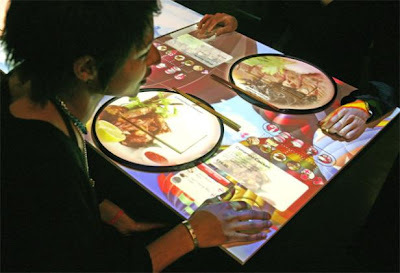 Table-mounted touchscreens are also also becoming more widespread. The system used in a hi-tech Hollywood restaurant, uWink, is being licensed in the USA, while Israeli company Conceptic has a British partner, touch-uk.com, after successfully installing its "e-menu" screens in a number of restaurants in Tel Aviv. "The reaction has been really positive," says Touch's founder, Ron Golan. "As long as the screens are implemented in a way that isn't kitschy or gimmicky, and they're tailored specifically to the venue, it's great for both customers and businesses." Few restaurants, however, will go as far as Baggers, a restaurant in Nuremberg; it has dispensed with waiting staff altogether, with orders taken via touchscreen and food sent to the tables down a mini rollercoaster from the kitchen upstairs. "I'm not sure that using gravity as a waiter provides a very personal dining experience," laughs Hunwick. How could restaurant technology develop? O'Loughlin looks forward to the day when regular attendance gives you preferential treatment, allowing you to jump reservation queues automatically. "Or a way in which your preferences could be remembered," she says, "the technological version of 'Your usual, madam?'" Our notorious fear of the wine list is already being tackled by computer power, with Mayfair restaurant The Greenhouse allowing you to negotiate their extensive selection using an interactive list. Hunwick himself is predictably coy when it comes to Inamo's own plans, lest competitors steal a march on them, but his team have devised ways of using the system to order personalised pizzas, and they're also looking into direct hookups between the touch panel and local minicab firms so you can pay and be instantly whisked away. "There are many things we could incorporate for people to look at and play with while their dining companions visit the bathroom," says Hunwick – but they've stopped short of enabling full internet access. "For obvious reasons, really," he laughs. "There are some images you just don't want displayed on your table while you're eating."